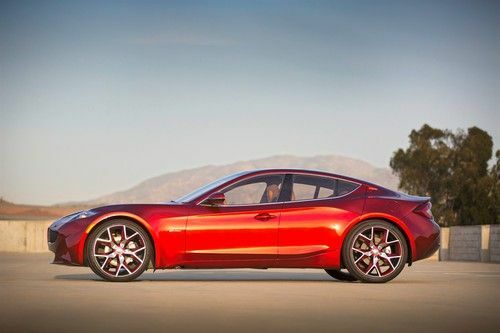 Fisker rejects Romney's 'Loser' tag, will his attack backfire on Romney? In attacking Obama, Romney tagged Fisker, Ener1 and Tesla as "losers," but Romney runs the risk of the attack boomeranging because Tesla and Fisker are hardly in trouble, and instead are on the threshold of success. In Wednesday's Presidential Debate, candidate one of Mitt Romney's zinger attack lines was to associate three electric car related companies as losers, while invoking the ghost of Solyndra. One of those companies, Fisker Automotive, has responded with a statement sent to several news outlets saying "We don't consider ourselves a loser," while reiterating the company's business success. The three company's on Romney's list, Ener1 and Tesla Motors, Fisker Automotive are all in in business, raising private investment capital, manufacturing and selling products, but have not grown to the point of breaking even much less turning a profit. Are Fisker, or Ener1 or Tesla, Loser's? If these companies are not 'Losers' does it reflect badly on Romney's credibility? Fisker Automotive is a designer/manufacturer of luxury plug-in hybrid electric cars, launched a few years ago by famed automotive designer Henrik Fisker. The company was one of the recipients of Dept. of Energy loans in the Advanced Technology Manufacturing Program, a Bush-era program which has been incorrectly tarnished as an Obama-era program. Fisker's $527 million loan program was split into two portions, one to support development (but not manufacturing of) the Fisker Karma, and the other to support development and manufacturing of the Fisker Atlantic (code named Nina). While Karma manufacturing and delivering did begin a year ago, it was badly delayed. Delayed enough to miss several milestones required by the DOE loans, and in March this year the DOE froze the loans to Fisker. Fisker had drawn about $190 million from the loans, and the rest was primarily meant to support manufacturing of the Atlantic. The frozen loans derailed plans to start manufacturing the Atlantic this year, and the company laid off the workers who were refurbishing the former-GM plant in Delaware where the Atlantic was to be manufactured. All along Fisker has been raising investment dollars from private investors, as is typical of start-up's. To date the company has raised over $1.2 billion in private investment capital. That's a lot of money, representing a big vote of confidence from investors. And what about deliveries of the Karma? In May the company issued a "business update" that said the company had delivered over 1,000 Karma's since December 2011. This week that number is now 1,500 Karma's delivered to paying customers. Additionally the company is expanding its dealer network all the time. Along the way its U.S. workforce has grown to over 1,000 employees in Engineering, Design, and other work. Is this the picture of a Loser company? Likewise, are Ener1 or Tesla examples of Losers? Ener1 did go into bankruptcy last winter, but it was in cooperation with the company's creditors and the company has since emerged from bankruptcy and is still selling products to customers. Tesla Motors on the other hand is the very picture of a start-up company that is firing on all cylinders and positioned for greatness, needing only to ramp up sales as predicted to get past the break-even point. As it stands, Elon Musk is predicting that Tesla will be "cash flow positive" by December, though that phrase doesn't have a precise meaning in accounting. Clearly Romney was making a politically motivated attack, because he needs to portray Obama's policies as a failure. It's up to the listener to gauge whether Romney's attack is accurate. What, then, can he mean by 'Loser' in this case? The one thread of truth is that none of these companies are turning a profit, which makes them dependent on outside injections of money. The future for both Fisker and Tesla looks bright, but their balance sheets today are bleeding red ink. That's normal for a start-up company during its early phases, while it ramps up sales. It's too early to say definitively the fate of these companies. In the meantime does Romney's attack on Obama reflect badly on Ener1, Fisker and Tesla, or does it reflect badly on Romney? Dave, Your right on point with your comments. Romney repeats the bumper sticker statements of Republicans but doesn't seem to grasp the boots-on-the-ground realities of people who work for a living. He's cashed in by moving money around after he started with daddy's fortune to begin with- hardly a "self-made" example of the American dream. More like the American inheritance- and an unethical one at that. Where is his compass of values? Does he truly have any besides making money and obtaining power? He's been anything but a "conservative" all his life. The answers are obvious.